For more information on these photos see Big cat roaming around Dochgarroch? Those pics certainly look like cat to me, as they seem to have the right shape and as far as I can tell from the photo they also have the cat heel pad indentations. 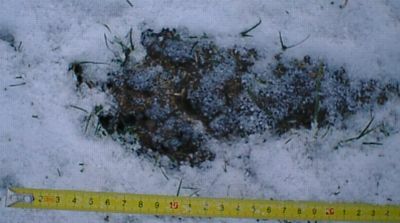 It is hard to see clearly as it looks as if bits of snow may have fallen into the track. At the largest size that I can display your pictures, I am afraid they still look like dog (I have boxes of pictures and casts of tracks that I very reluctantly decided were dog, myself). 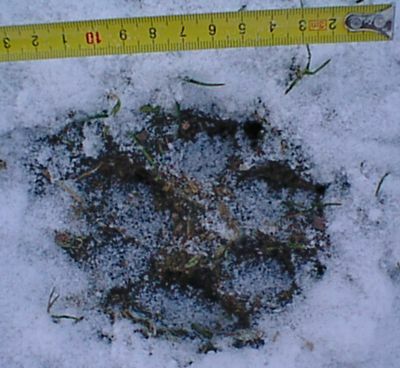 Big cats have much larger rear pads than dogs (see the puma tracks pictured above). Pumas have more asymmetric feet than dogs, with two distinct lobes at the front of the rear pad and two at the front. The individual digits make tear-drop shaped impressions. The claw marks are rarely visible unless the cat actually slips, and since pumas proceed everywhere at a walk unless actively hunting or being chased, the front and rear padmarks are often more or less completely superimposed, giving a rosette-like effect. I'm sorry I don't have similar stuff for leopards or lynxes - maybe someone else can help? 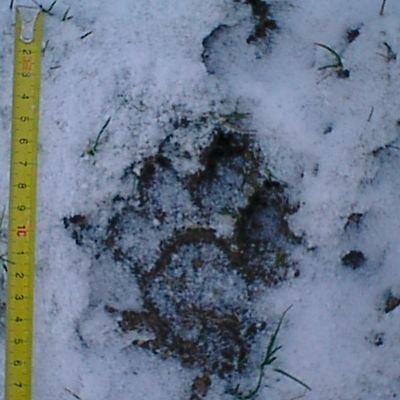 I will certainly defer to your judgement regarding puma tracks, because you have seen them in snow and I have not, but I still think this particular one may be leopard. Regarding tracks, I learned something only a few days ago after our light snowfall. Commonly, felines will leave a double, or what would be described as overlapping prints. I had previously believed this only occurred when the cat was stalking prey, as it made an effort for stealth. As I watched our bobcat walking through the snow, I could see that each print was overlapped. It was amusing the way these tracks appear doubled behind each step. Our domestic cat, who was directly beside her left only single prints. Usually, claws will be seen in feline prints when the cat is walking in soft ground which causes the mud to squeeze between the pads and the claws to protrude. The same would occur in snow but would'nt be visible. I referring to lynx and bobcat, but I suspect it would be the same with the cougar and leopard.